I read this article and found it very interesting, thought it might be something for you. The article is called Janetter Twitter Client Review and is located at https://www.ben-johnston.co.uk/janetter-twitter-client-review/. As you’ve probably noticed if you’ve been following the blog or my Twitter account, I struggle with sticking to one social media client for more than about five minutes. I’m really bad at it – they always start out great and then an update will remove something I like or put it in a stupid place, or they’ll just stop working and I end up looking for something new. 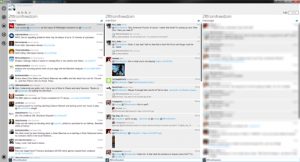 It’s been a while since I wrote my Hootsuite vs Tweetdeck post, where I crowned Tweetdeck the king of desktop apps, and a lot’s changed since then. Tweetdeck screwed the pooch with their latest update (have you tried it lately? Yuck! ), Seesmic was my favourite for a while and then it broke, so now I’m on Janetter. Today, I’m going to write a quick review of it, what I like about it and the things that it can do to stop me moving onto something else in a few months. While some Twitter clients try to get everything in there, allowing you to manage all your social networks at once, Janetter only does Twitter. Apparently the developers are working on getting Facebook integrated into it too, but there’s no mention of LinkedIn, Tumblr or Google + (which will cause tears from literally no one), but right now Janetter is an example of doing one thing and doing it well. The thing that really sets Janetter apart from the competition at this stage is how customisable the layout is: it’s built on Chromium (Windows version only, I haven’t tried the Mac version) and comes with 27 designs that you can use or, if you’ve got the necessary HTML and CSS skills, you can create your own. It supports HTML5 and CSS3 too, so it’s definitely looking toward the future. If you don’t have the necessary HTML chops, you can still customise it by changing the background, which is definitely a nice touch. Personally, I’m using the Metro Light theme and it really is very easy on the eyes – beautiful typography and a very clean layout. It has a great conversation viewer allowing you to identify which Tweets your friends are responding to (handy if you have friends/ family members who tend to reply to two-day old Tweets) and I find it’s pop-up notifications to be much less intrusive than Tweetdeck’s. You can also set it to notify you if someone new follows you, which is a really nice touch. I also like the way that images pop up when you click them rather than being taken to a browser. Janetter is very customisable and although it only supports Twitter, it has multiple account and custom search panel support so I can still use it for work. There are some limitations, though. As I say, there are a few limitations with this Twitter app, and they may well be a deal-breaker for some “power users”. You can’t schedule Tweets with Janetter, for example, which may annoy some people. Personally, if I’m going to schedule a Tweet (usually reserved for the glut of articles I read from my phone or tablet on the train to work and want to share/ pimping posts on here), I use Buffer or whichever app I’m running on my phone or tablet this week, so that’s not a big loss. Some people have also complained about it using up a lot of memory. I’ve not noticed that, but my home PC has more memory than anything will ever need and my work PC is lacking in memory at the best of times. I will say that Janetter definitely seems to run smoother on my work PC than Seesmic did, which was my previous app of choice. There are no Android or iDevice versions of Janetter, which is a bit annoying from a synergy point of view, but they are apparently underway and I’ve found that Twicca for Android looks and works very similarly, so if seamlessness is your thing, give that a look. The real limitation for this program is that it only supports Twitter at the moment. Since I try to avoid Facebook as much as possible, and LinkedIn’s status screen seems to be a mirror of Twitter these days (seriously, people, disconnect your damned Twitter & LinkedIn accounts! ), it’s not a huge issue for me, but it would be nice to have these supported. With some applications trying to bring absolutely every social network in the known universe under one roof, it seems like Janetter could lag behind if it’s not careful. Janetter is a beautiful, simple Twitter client. There’s a slight learning curve with its range of options, and the limitations may stop it reaching major adoption amongst “power users”, but right now, it’s my weapon of choice. My suggestion is to check it out and see if you can get on with it. If you want everything in one program, I’d suggest Seesmic, if you just want a clean Twitter application that works, give Janetter a go. I’d definitely like to see more features added in the future (Android app, please), but in many ways, its simplicity is its strength. I hope you enjoyed today’s post. If there are any other apps you think I should take a look at, let me know.